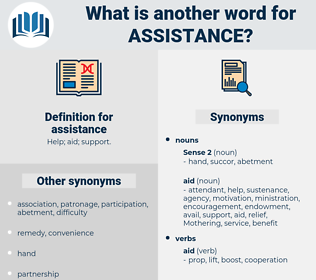 What is another word for assistance? agreements, principles, offers, tips, councils, nations, positions, Children, procedures, media, claims, posts, Bodies, helping, asistencia. donations, recipients, commitments, inputs, candidates, participants, audiences, facilitators, Donors, sources, payments, victims, Deliveries, attendants, attendees, ties, guides, Facilities, projects, supplies, exchanges, auspices, Deputies, dollars, totals, Gases, favors, awards, bursts, guys, EXAMS, airports, flows, goods, nations, aiders. helping, succour, concurrence, groundhandling, presence. Cooperated, noted, placed, used, endorsed, Was, received, Served, said, guides, Did, facilitated. donated, Introduced, implemented, Offered, Targeted, Amplified, renewed, Aimed, derived, covered, given, taken, Carried, facilitated. enhances, uses, fosters, regards, serves, positions. assist, Organizations, requests, relief, Assisting, care, supports, welfare. attendances, contests, preparations, allocations, handouts, Efforts, workers, needs, Countries, assist, requests, supports. 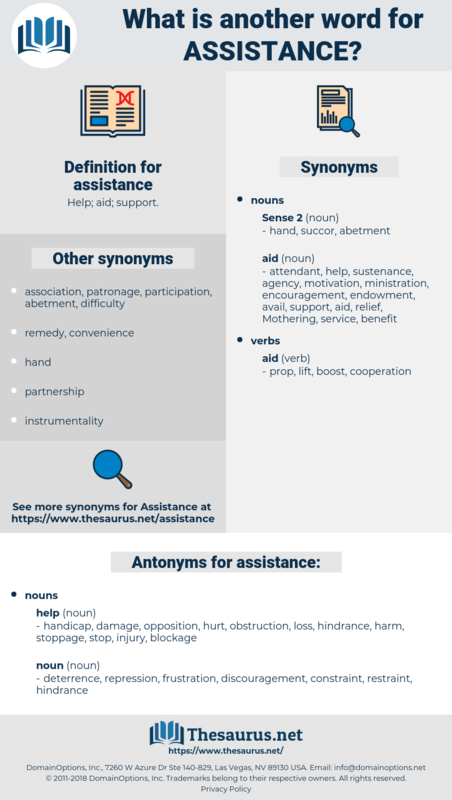 assist, relief, facilitation, Assisting, representation, care, expertise, encouragement, subsidization, counseling, compensation, bailout, welfare. needed, assist, Helped, helping, Assisting, welfare. handicap, damage, opposition, hurt, obstruction, loss, hindrance, harm, stoppage, stop, injury, blockage. deterrence, discouragement, constraint, repression, restraint, frustration. What should he do - summon assistance and have the room broken open? Can I offer you my assistance? acquittance, astuteness, agedness, agitating, auction house, acting, actinic, asthenic, acetonic, actinomycosis, accidence, azotemic, astonish, acuteness, actuating, academic, actinomyces, actinozoa.